Well, just got this in the mail today, last I heard it was only up to the 2006 model year. Well, that's comforting to know AFTER my brother drove the truck into a ditch. What years were recalled ? Not sure what the site is but there's a web site you can enter your VIN and it will tell you if there are any recalls for it. My 99 had a cruise control recall and my 07 has the airbag recall. The funny thing is they let us drive them for 3 years or so because there wasnt enough replacements. Now we get an URGENT letter now that they have enough. I tried the VIN check thing, and nothing came up for my truck. This was about a week ago, and I got this letter today. 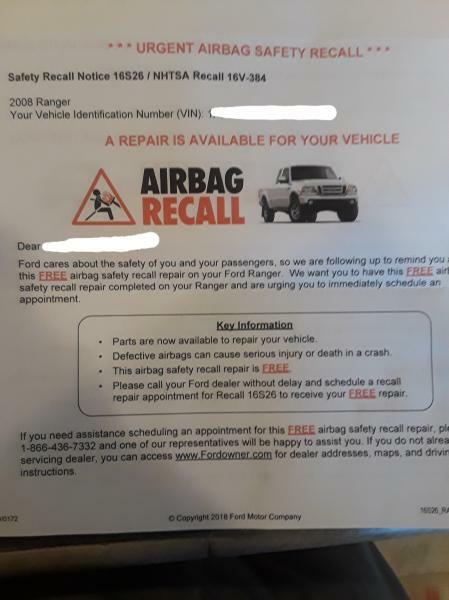 Last I checked, even on Ford's website (i looked up the recall number) it was 2004-2006 were the years that had the Takata airbag malfunction, but mine is obviously a 2008 as shown on the paper. Maybe I could have randomly gotten a left over airbag....? Unlikely, but things happen sometimes. Curios to see if anyone else will get this. Ok on the Air Bags, at least the years are going up not down ! I got the Cruise Control Fix a long time ago, it seems like ten years ago, I think it was before I retired. Anyway, if its free get it done ! I'm waiting for the Ranger FRAME Recall... ya right ! Mine is an 07 sport. I got the airbag recall 3 years ago or so. I got the new letter this week as well. I've been waiting about 3 years for availability of a replacement. I nearly lost my mind when they started bankruptcy proceedings to enable them to sell the company. It appears ford had to come up with the replacement. I still cant believe our government allowed them to file bankruptcy in order to sell there company. They made millions off of a defective products and we allow them to walk away and sell their company. They should be so buried in debt and out of business forever in my opinion. Someone got paid off, as usual ! Why can't we just let companies/people pay for what they screw up, you did it, you pay for it ! There is always a loop hole if you want to find one ! Page processed in 0.1754 seconds (16% database + 84% PHP). 60 queries executed.